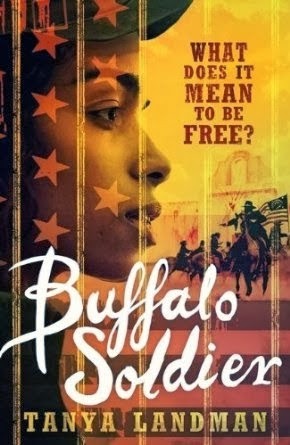 Buffalo Soldier begins in Gone With The Wind territory – on a cotton plantation in the deep south, just before the beginning of the American Civil War. But this story is not told from the point of view of the owners, but by one of the slaves. So far, so interesting. However, this is not about the Civil War itself. It’s about the aftermath. Charlotte, a slave, and her surrogate parents, Cookie and Amos, expect that when the Yankees march in, a new world of freedom and happiness will be theirs. They soon find out their mistake. Forced to follow the Yankee column after the soldiers have razed the great house and destroyed everything which might have been used for food, they eventually escape; but they have no means of providing for themselves. Worse, hostility and prejudice are apparent on every side. In an almost post-apocalyptic landscape, everyone turns with a will to persecuting the former slaves, and when Charlotte does the simplest thing – staying on a pavement instead of stepping off to give way to approaching white people – she, and more especially, Cookie and Amos, pay for her temerity dearly. Alone now, Charley decides that safety dictates she must pass for a boy. And then a passing stranger suggests she should join the army. She finds herself in a black regiment – the Buffalo Soldiers. Their captain is a kind, enlightened man, and she makes good friends; she has found a kind of home. But eventually, after the training, the real work begins, and it involves the persecution of the Indians. Charley’s innocence is gradually lost as she begins to see clearly just what they’re doing: but what choice has she but to carry on – not only witnessing, but also eventually perpetrating horrors? What can she do but follow orders – where else can she go, how can she survive? This is a difficult read: Tanya Landman doesn’t spare us the grim details of what the Indians and the Army did to each other, or of the compromises necessary to stay alive. There is a redemption of sorts, but it’s partial – how could it be anything else, when we all know how long it was before the black people of America really gained their freedom, and what the fate of the native Americans was to be? But we’re carried through by the voice of Charley, who is courageous and caring and just keeps going. It’s an astonishingly consistent voice; it never slips, from the first few lines: ‘I guess Ma died. Or she was sold. I don’t know which… All I got from her was a name. Charlotte. Darned fool fancy thing for a slave girl. Didn’t no-one never call me that.’ We’re inside her head, and with her, we journey through a tragic landscape because there’s nothing else we can do. It’s a remarkable book, and I’ll be very surprised if it doesn’t win prizes - and lots of readers. Off to get this from local Waterstones. Glad to have a review as a reminder now the book is out there. Publicity and availability can get out of sync, imo! I have now been into Waterstones and ordered Buffalo Soldier. Arrives Tuesday! A great review of a great, original and courageous book. You're right - it deserves to win lots of prizes. Justice should, at least, prevail in the book industry!